What a surprise this store was! It’s not big, it’s HUGE. Sooooo many choices. Soooo many colors, and, in my opinion, not expensive at all (but what do I know, I’m only a beginner at this). 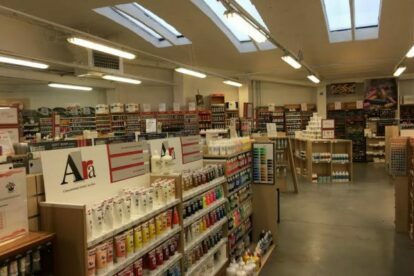 This is definitely the place to go to if you need art supplies: paint, aquarelle, gouache, paper, pencils, crayons, even simple color markers… even if you’re more into sculpture or working with clay, you’ll also find what you need. They originally started out as a business in custom frames, back in 1825 and a big part of the store is still equipped as a frames shop. Whatever you have in mind, they can probably help you out.